I hear so many people say “in my future I will be great”, yes, that’s true. “In future, my life will be beautiful”, of course. They even ask questions like “so when will my future come?” Hey, listen to me, your future is not tomorrow, your future is not acquired through luck, your future is not something that is confined to time. Your future is a discovery; it is something that is already resting inside of you. Do you want to tell me your future from yesterday is today? Then you will continue to live life but not your future. You get to know you are living your future, when you start making influence, creating impact, loving what you do and being valuable to humanity. Every man, ever created by God, has been embedded with influence. Inside of you is a deposit of greatness. You were created just like a seed of an orange: in an orange seed lives an orange tree, in a mango seed there is a mango tree. You are a walking future. Stop asking and waiting for the future to come and start discovering it. Society and circumstance always try to define life for us, making us feel and think that our future is achieved at a particular stage of life, so we grow with these things defining our future for us. That you cannot live your future if you haven’t achieved “so, so and so”, and if you are still in a certain circumstance, you have no future. Irrespective of those facts, if you achieve your future at a young age, they say you just got lucky. These beliefs leave us with little efforts to discover our future because these same beliefs haunt us when we are at home, they follow us to school, pursue us at the workplace, market, social gatherings and even in our sleep. Don’t let the negative beliefs of society stop or delay you from living your future. And don’t be afraid to start. If you are always scared of starting your future click this link (https://www.modernghana.com/news/807647/dont-wait-to-start-when-it-looks-good-start-when-its-scar.html) and read my previous article that will inspire you to start now. Start living your future when you discover it. Some people start living their future at age 9, while others start at age 67, that's it, it's all about discovery. It is up to you to know the time to start living your future and start living it when you discover it, don't wait for society or circumstances to tell you when to start. You can live a life and die but never get to live your future. This is the reason why we only remember some people of old but can't forget some other people, because the latter discovered their future and purposefully lived it. DJ Switch, at age, 9 started living her future. She, including several other kids across the globe, is making influence at a very young age and already living her future. Colonel Sanders, the founder of KFC, never discovered his future until age 65. Lucky enough for him that he got it right. Perharps, he could have sent his future to the grave. How long do you think you can wait for your future? Your future is a discovery of your life's purpose and living it. Having enough money to pay the bills and take care of the family doesn’t mean you’re living your future. You need to have a self-fulfillment, you have to purposefully live the life you were created for. 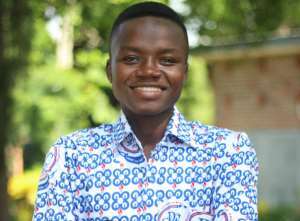 Let me end with this, a friend (mentee) of mine, Joseph Kutawutie Adda, who has only acquired a senior high school certificate and had not made plans for further studies for some years now, discovered his future as an author. He told me how he wanted to start living his future. I could see the passion, trust me and I loved it because I knew where it was leading him to. With hard work and commitment, he came out with his first book “Set My Soul Ablaze”. This book was supposed to be launched in 2017 but it wasn’t possible. Joseph never gave up, he just wanted to start living his future, and finally the book was launched in a grand style like other books never got, in the beautiful Cockpit Lounge in Achimota Mall, Accra, on 9th March, 2019. The book is leaving shelves like running water and I believe over 10,000 copies will be sold before December. Joseph has never been ecstatic and so sure about his future like he is now. You see, it is all about discovering your future and being willing to start living it, don’t procrastinate. I know some people who have written great books but are waiting for their master’s degree to publish them because they believe it will add value to their books. I know someone in Tamale who cannot forgive himself because he had a business idea that JUMIA now runs, an idea he didn’t work on because of so many useless excuses. Listen, people who are so passionate about achieving their future give up everything to live their future, to live your future you need to take big risks. This is the time for you to discover your future, don't make excuses; make possibilities because there's nothing that's impossible. Go out for gold, you're precious and great, go and create influence. Find my contact information below and let's talk.